SOCHI, November 1. /TASS/. The mandate for the International Atomic Energy Agency (IAEA) on the Joint Comprehensive Plan of Action (JCPOA) does not provide for inspections of Iranian military facilities, Russian Deputy Foreign Minister Sergey Ryabkov told reporters on Wednesday. "We see eye to eye with Iran’s position on this matter. The IAEA mandate does not authorize inspections under Section T [which covers those technologies that can be used to make an atomic bomb, including the simulation of a nuclear charge explosion by a computer]," he said. Ryabkov noted that there is a special mechanism to discuss all disputable issues, namely, the Joint Commission. "Therefore, if someone has any questions on that score or any additional considerations, they can be discussed there," the diplomat noted. 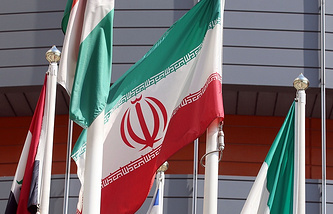 In late September, US Permanent Representative to the UN, Nikki Haley, said that Washington was in favor of IAEA’s inspection of Iran’s military facilities due to fears that Tehran was secretly developing nuclear weapons in violation of the deal reached together with six international mediators (Russia, the UK, China, the US, France and Germany). Reuters earlier reported citing IAEA Director General Yukiya Amano that the agency asked all signatories to the nuclear deal to clarify the so-called Section T.
On July 14, 2015, Iran and the P5+1 group of world powers clinched an agreement on resolving the Iranian nuclear program. The Joint Comprehensive Plan of Action hammered out by the participants envisages the lifting of sanctions imposed on Iran by the UN and the EU in exchange for Tehran’s commitment to scale down its nuclear program and place it under international control. On January 16, 2016, it was announced that the implementation of the deal had begun. Washington lifted the sanctions it had slapped on Iran over its nuclear program.